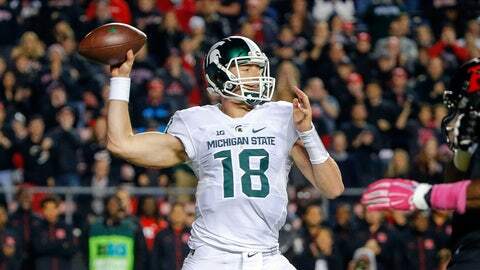 How much might Michigan State ride Connor Cook during his hot streak? Connor Cook threw for a career-high 398 yards last weekend. With quarterback Connor Cook coming off his third-straight 300-yard passing game, Michigan State head coach Mark Dantonio was asked if he anticipates his offensive coaches tilting the game plan more in the direction of the senior signal-caller. His answer indicated a no… unless they do. “I always say what are the keys to victory, and I said offensively we've got to be who we are,” Dantonio said Monday during his weekly press conference in East Lansing. Most associate Dantonio's Spartans with a conservative offense built around a power running game, but that is not the only aspect that makes up his coaching philosophy. Another, borrowed from Ohio State head coach and mentor Jim Tressel, calls for trying to win the surest way, and that is often predicated by what his players do best, not to mention what the game dictates. So while the coach wants to make sure his stable of talented running backs get plenty of chances to pound a defense, he knows sometimes the ball just has to be in Cook's hands. “I don't know that we game plan specifically to say he's going to do more,” Danotnio said. “Our quarterbacks have always done a lot here. They've always been asked to do a lot. But the productivity that we're getting from our quarterback position obviously is great, but it still to me means who are we playing against, who are the matchups, what do we have to do to win the football game, and I've always felt like we've got to be balanced. We have good running backs, and we've got to be able to take clock.